Good morning and welcome to the on-time and on budget Britblog #286. A lot has happened this week, but by far the most important development was that of the blogging retirement of Britblog host and all-round good-egg, Mr Eugenides, to tributes from all round the Blogosphere, including mention from Comment is Free. The observation that the catharsis of blogging is a medium best suited to oppositional politics isn’t new, which explains the resurgence in the Left-wing blogosphere. Before May, a strike, especially in the public sector, was an embarrassing family argument. Best not spoken about, you know… pas devant les enfants. Now of course, a strike is a glorious battle against the hated neo-thatcherite enemy. Dave Osler gets stuck in by suggesting that Strike negotiation is a game (once more?). Of course, one group who will, thankfully be in oppositional mindset forever, and will therefore NEVER feel the need to throw in the towel is the Feminists. You cut, we bleed, says the F word. Philobiblon tries to be more upbeat by reviewing “Rethinking Contemporary Feminist Politics” by Jonathan Dean which can be yours for £54 on Amazon. Those long winter evenings will just fly by. I’m more drawn to The ever quirky ‘Early Modern Whale‘ who brings us the tale of John Allen, author of Judicial astrologers totally routed, and their pretence to Scripture, reason & experience briefly, yet clearly and fully answered, or, A brief discourse, wherein is clearly manifested that divining by the stars hath no solid foundation … published by J.A. for publick good, Printed for John Allen (1659). Back to the sisters, Progressive Women brings us the news of the 2010 “Feminism in London” conference. Men were allowed, apparently. No, I couldn’t make it either. More seriously, ‘Too Much to say for Myself‘ brings the harrowing story of a seemingly preventable murder, as the Victim’s mother contacted the police no fewer than 102 times about her ex-husband, but was dismissed as having ‘a tendency to over-react’. Of course, the problem is taking every complaint seriously would lead to intrusive policing as every vindictive, vexatious complainant attempts to get their enemies’ collars felt by the fuzz. It is to prevent this super-surveillance dystopia that Crash! Bang! Wallace jokingly calls for a “buffoons register” to list those calling for intrusive government intervention. Of course in the Chanelle Sasha Jones case, or indeed the better-known Baby P or Victoria Climbie, better, or more intervention may have averted tragedy, but then no-one would want to live in the kind of society where Every tragedy could be averted. It really is the difficulty about using individual cases to highlight failings: the counter factual is not available. How many men would you deny access to their families at the behest of a potentially hysterical woman (or, indeed vice versa) to save one life? The policeman’s job is not an easy one. Of course libertarian, feminist, socialist or some combination, the joy of the blogosphere is not in the ranting, entertaining though that is, nor in campaigning whatever your axe to grind, but in the enlightening posts by people who really know what they’re talking about, for this is the one area where the Blogosphere really beats the Mainstream media, hands down. Former diplomat, Charles Crawford points us to a shameful episode in Britain’s history, and suggests that the EU fund a significant search for the mass graves and in identifying all the bodies where possible, go a little further than “regret” way of reparation for the complicity all nations have in the mass-murders of the 20th century. On an entirely different subject, but another guest post from an expert, A Place to stand brings us an idea to ameliorate congestion on the forth road bridge (the one that doesn’t need painting all the time) at considerably lower cost than the (several, and climbing) billions a new bridge is projected to cost by building a ‘tidal’ fifth lane in the middle instead. Of course, as any traffic management expert would tell you, building more capacity on the roads merely generates more traffic. This is especially true in London, so the cyclists behind “at war with the motorist” have some good points on encouraging cycling. People don’t cycle because it’s horrible and scary sharing the road with fast-moving traffic which isn’t expecting to see you. By building the cycling infrastructure, you encourage cycling, which means motorists are more likely to expect cyclists, which makes cycling more pleasant in a virtuous cycle which has been achieved by the (equally cold and wet) Germany or Holland. 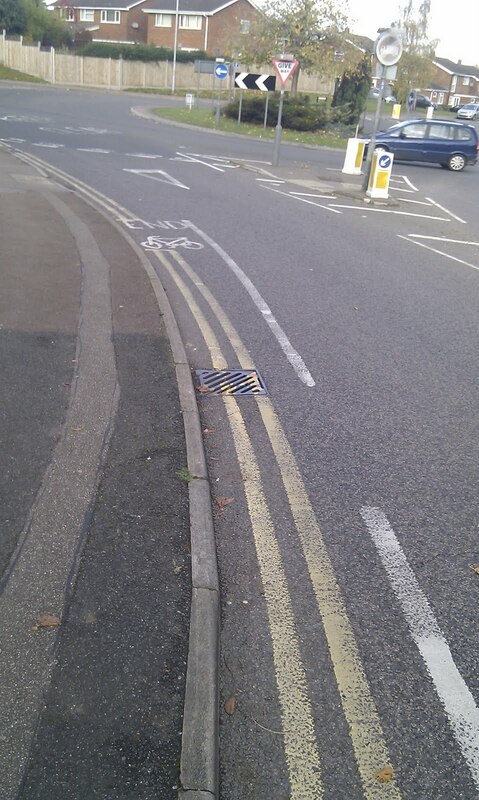 The problem with cycling infrastructure is that, yes, it’s local, and therefore ends up, after being filtered through town-hall incompetence forming a half-arsed attempt to meet Government targets, and therefore ends up looking like this pathetic, dangerous and counterproductive effort in Hitchin. While we’re on local issues, I wonder what would happen in the independent People’s republic of Yorkshire? One thing that is going to be harder in the future is for Mainstream media organisations to get away with untruths – people now have a means to get another side of the story out. In this case, The BBC being forced to apologise to Bob Geldoff. Brian Barder doesn’t think this is enough. Nor does his son Owen Abroad. Both these guys have an interesting perspective on the issue. Camden Kiwi (one of the few I know of who won’t be rubbing it in about the Rugby) reviews Tenessee Williams’ Two-Character Play at the Jermyn Street theater for us. Diamond Geezer doesnt think much of One New change, (nor was my Brother with Jamies MeatFeast restaurant there earlier this week). Tim Worstall enlightens us as to where “Posh” might have come from: Persian. Virtual Economics reckons the Times’ paywall is about News Corp, not The Times. As any discussion about politics always ends up about a discussion about economics, A Place To Stand brings us his Growth Plan. It starts 1) cut the deficit, then… before suggesting a lot more Nuclear power, followed by a British Mars shot. A view with which I have some sympathy. Transition culture reckons the Economics of Happiness is more important than building huge national penises to get to Mars, and recommends downshifting to prevent burnout and save the planet. And I have some sympathy there too. The Blogosphere is a glorious cacophony of voices, all with their own magic, quirks, and individual ideas, as anyone who has attempted to weave a narrative around the disparate posts which appear in the Britblog inbox will tell you. At present the libertarians are waning, the left is rising. What the future holds, no-one knows. The only thing I am sure about is that Blogs are often more informed and informative than Newspapers. They are also more varied. Democracy is stronger when everyone has access to a voice. So there we have it. The end of the weekly roundup. Next week, we’re with Mick Fealty at Slugger O’Toole. Please send him the best stuff you find this week to Britblog [at] gmail [dot] com.